Female soldiers are preferred to operate remote killing devices because of a shortage of male recruits to Israel’s combat units. NAZARETH // It is called Spot and Shoot. Operators sit in front of a TV monitor from which they can control the action with a PlayStation-style joystick. Played by: young women serving in the Israeli army. Spot and Shoot, as it is called by the Israeli military, may look like a video game but the figures on the screen are real people – Palestinians in Gaza – who can be killed with the press of a button on the joystick. 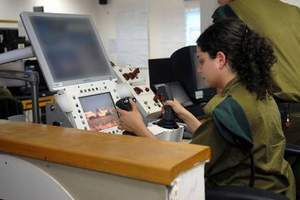 The female soldiers, located far away in an operations room, are responsible for aiming and firing remote-controlled machine-guns mounted on watch-towers every few hundred metres along an electronic fence that surrounds Gaza. The system is one of the latest “remote killing” devices developed by Israel’s Rafael armaments company, the former weapons research division of the Israeli army and now a separate governmental firm.